When faced with the word ‘fundraise’ as a privately educated child’s parent, you may feel a little green about the gills! When I’m paying such high fees, you might wonder, how can this school have the audacity to ask me for more money? Your immediate response might take some time to die down - but when it does, think about all the things that exist in your child’s school. Most of your fees probably cover teaching staff, building costs and then specific extras like school dinners. But schools often need extra funds for things like special events, pupils’ educational visits, improvements to the school building, or sports, music or art equipment. If you are already stretched you might feel nervous that the school will look upon you negatively if you don’t help out with fundraising, but remember that if you want to help your child’s school but can’t give financial aid, you could donate your time towards fundraising causes. The best ideas come from lots of people brainstorming. Encourage your child’s class parents to get together, or use the forum of the PTA if there is one already established, to come together to think up some great ideas that will raise money for your school while enabling children and parents to learn or have fun at the same time (if possible!). First think about what you’re raising money for and consider specialised fundraising ideas. For example, if the school needs a swimming pool, consider having a sponsored swimathon in the local pool where each student asks friends and family to sponsor him or her 50p per length. Or if money is required for music development in the school, hold a pupil concert and charge for tickets. One popular idea is for students to come to school in non-uniform - if they are charged a £1 for the privilege, that can soon raise thousands. It’s a good idea to donate some of this money to another charity too, in which case solid values of community benefit can be established. Other themed days could be aimed at parents - some schools put on barn dance nights or quiz suppers, which can raise large sums for schools. Remember that if a very large amount of money is required, you might to establish a range of events. There are even more imaginative ideas that some schools have signed up to. On the internet, there are cashback sites available where whenever a buyer purchases something from specific websites (such as John Lewis or Amazon) a percentage is paid back to the school. Look out also for the supermarket voucher schemes which offer schools resources like books, computers, sports and music equipment when parents spend money in store. 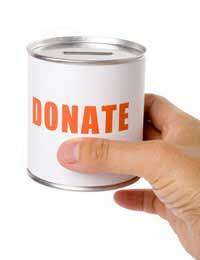 A further way you can raise funds through the internet is via initiating sponsorship through websites like Justgiving. Set up a website for your school, then every child can be encouraged to get involved with fundraising, and can watch the school’s progress online.